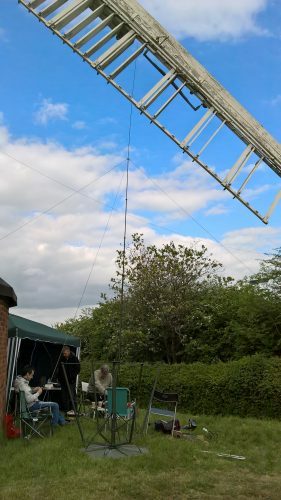 Mountnessing Windmill – Havering & District Amateur Radio Club. Just a quick write up of Mountnessing Windmill until I get time to write it up better. Another great day out for the Havering ARC. Making some contact with some rare mills and a few old ones. Quite a few Dutch mills in the log and quite few German stations in the log to. Shame to see the mill in disrepair at the moment so we hope our small donation went some way to getting it fixed up. Also thanks to Karl, Essex County Council and the friends of the Mountnessing windmill for making us feel welcome. Steve G8PMU making a few on his ex-military equipment. A great day for experimenters. Also worked the usual 160m club top band net. Who? What? 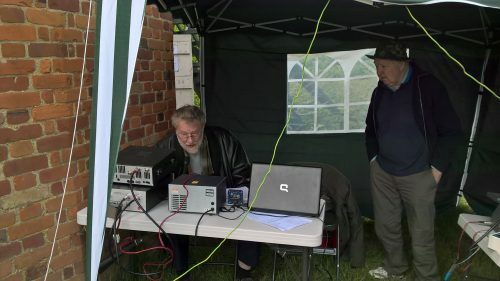 When……is that the great man Oliver G3TPJ operating. Oh yes… we had a really great experience with Oliver operating. Oliver bringing his own form of wit to the windmill (we were in stitches with Oliver’s jokes). Also in the shot is John 2E0WJI John Dale. Didn’t go through the night on this one as many of us had other commitments but a great success. Thanks to the guys who helped make it happen.